Helping to entertain Rochester, NY, since 1988, Spatola’s Party Rental knows the ins and outs of a successful occasion. Whether you’re looking to celebrate a high school or college graduation, dance away your wedding night, or just ring in the New Year, their creative staff provides and organizes every event rental you can imagine. Not looking to indulge in a private party? Spatola’s Party Rental also offers the best in trade show equipment for hotels and convention centers, as well as the food service industry. From rental chairs and tables to buffet serving equipment and table place settings, you will rest assured knowing your convention is fully prepared for all of your guests. Hosting a large-scale business gathering leaves no room for extraneous stress. 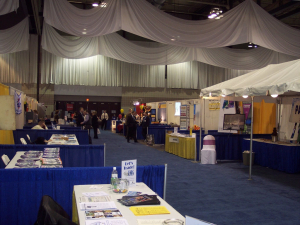 No matter what size event you are planning, Spatola’s experience ranges from 20-booth hotel trade shows to 100-booth events in the local Joseph A. Floreano Convention Center. From the bridal, automotive and electronic industries to college and government groups, their trade show equipment will adapt to whatever specific needs or clientele you may have. In addition to assisting you in the planning process of your trade show or convention, Spatola’s will take full control of the event day details, allowing you to reserve your focus for your business. No matter which level of luxury you have in mind, Spatola’s Party Rental will deliver flawless results. A quick look at their extensive catalog of event rentals reveals the total capability and versatility of their products. With everything from snow cone machines and BBQ grills to elegant white tents and gold-rimmed place settings, you can build your event piece by piece to achieve your full vision. If you’re in search of quality trade show equipment, let Spatola’s Party Rental make the details significant. Call the team at (585) 266-4200, or visit the website to find out more information about how the professionals can assist you at your next event.